Antique white kitchens are very attractive and popular because they always look so elegant and unique. In this article we have a bunch of interesting white kitchens that are set in different layouts and designs to make sure that they appeal to every taste. These antique white kitchen cabinets never go out of style. Antique cabinets are more popular than regular white ones because they are warm and cozy. This is why many people will prefer them over the regular white ones since they match beautifully with dark floors or countertops unlike the regular white ones which will look so dramatically contrasting with the dark objects around. For example having an antique white paneled kitchen will beautifully contrast with a dark black wall behind it. The look will be complemented with brass handles and glass framed cabinets. Matching such pieces with stainless steel appliances will add a sense of modernity while the having a solid wood carved dining table together with a silver chandelier will make this kitchen look classy and luxurious. The idea is to mix and match in a way that would add style to the kitchen. The best thing about this kitchen is that the white doesn’t look too white. The tint of beige matches beautifully with the dark brown floors and the silver accessories. The pendants add to the luxurious style of this kitchen. This granite used in the countertops matches beautifully with the antique white cabinets and looks like marbles. The white ceiling keeps the place looking wide and open and makes up for the small size of the kitchen. This is a white refreshing kitchen where everything looks in place. The pendants definitely complete the lovely picture. This kitchen looks like it has never been used, which could be true. However, of someone did try to use such a white kitchen then they would probably deal with stains and coloring on their countertops. This can be overcome by choosing a waterproof finish for the wooden countertops. There is something rustic and cozy about this kitchen that is made more obvious thanks to the 2 grey kitchen islands. They are both complemented by the grey marble counter tops, but one of them serves as a bar with grey stools that have white legs while the other is fitted with a sink. The overall grey look matches greatly with the grey wooden planks. This antique white kitchen pairs beautifully with the antique pendants that make this kitchen so unique. The countertops are made from white marble that beautifully match with black stools. There is nothing vintage about this kitchen as it is equipped with the most modern appliances but there is something majestic about the mosaic marble cook top that will appeal to everyone. Black granite countertops will match beautifully with this antique white kitchen. The white Carrera marble tiles complement the look. The kitchen is made complete thanks to the copper glass lanterns that hang from the ceiling in addition to the simple beige bar stools. Brass will add a sense of elegance and luxury to this creamy white kitchen. The antique white cabinets are covered by white marble countertops and white marble backsplash. The sink has a brass gooseneck vintage faucet that complements the whole look. The kitchen island is paired with a butcher block and the whole look is complemented with a rich cheetah rug that will make this kitchen so rich and cozy. Antique white will match with grey in this wide and simple kitchen. The white standing island might serve as a dining table in this elegant kitchen. The look is complemented with a brass pendant and faucet that is fitted in a stainless steel sink that matches the dishwasher built into the white cabinet. There is something about combining white with black that makes this kitchen one of its kind. The white cabinets are fully complemented the backless white stools that face the white cabinet which features a stainless steel faucet. On the other side, the black wooden chairs face the small dining table that matches beautifully with the stained oak wood floor. The brass lanterns add the needed warmth and elegance to the whole picture. There is nothing wrong about going simple. This minimalist kitchen is actually very elegant with the minimum accessories. The marble countertops will match beautifully with the wooden floors and will make this kitchen so elegant and comfortable. 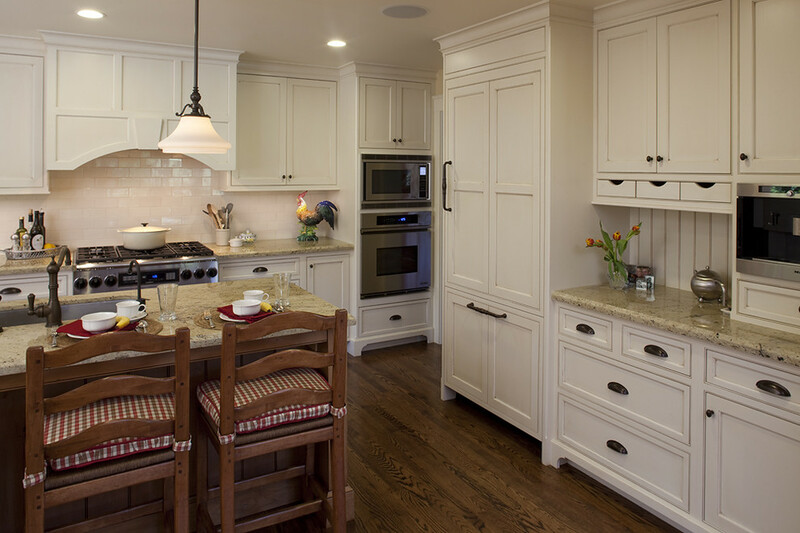 We love how this kitchen features different shades of white in the cabinets. The island is dark brown and matches with the chairs. This kitchen features a custom built wine rack and decorative corbels. The hammered glass doors create a visual illusion that makes this kitchen so unique and interesting. When you want to make vintage white look modern then the best is to combine it with some black like we did in this kitchen. The black countertops and the ultra-modern chairs are the most appropriate addition to make this kitchen unique and special. There is nothing wrong about mixing different types of metal in the same kitchen. In this antique white kitchen, the oil rubbed bronze knobs complement the look of the white cabinets while the nickel accessories that will look great on the kitchen island. All will match greatly with the light wooden floor. While some people want to have some bit of color, white kitchen cabinets will have a special feel of elegance and style. The light wooden table matches beautifully with the wooden floor. It doesn’t have to be pure white, but sometimes combining a few colors together will make for an elegant addition. The black wooden chairs match beautifully with the black cabinets and the bottom of the chairs matches elegantly with the dining table. You can always use a combination of black and white if you want to add some elegance to your kitchen. The white cabinets will reflect the light off the black ones. The stainless steel accessories and the appliances will make this the best combination. You should always see how light bounces off the countertops, the walls and the floors. You can add some white to your kitchen if you feel that black countertops are absorbing the light and making your kitchen looking dull and narrow. You should make sure that you are choosing something light for the floor and the walls to make sure that the sunlight still gets to shine inside your kitchen. You can add some plinths and details to make a classical kitchen look more modern. The scrolls on the plinths and the scroll shaped brackets send us back in time while the glass framed cabinets will match beautifully with the bronze handles. The beige tile floor and the grey mosaic tile on the wall behind the stove will add to the elegance and luxury of this kitchen. Antique white that looks more like off-white matches beautifully with black stone countertops and the stainless steel wine fridge. The modernity of this kitchen is further accentuated with the stainless steel sink. To make the kitchen wider and more open the hanging lanterns will make for a great lighting option. The minimal design of this kitchen is complemented with the granite countertops. The paneled cabinets and drawers have small brass handles that match greatly with the rattan stone colored country style chairs. The sandstone tile flooring is a great match to the paneled white kitchen cabinets. The same sandstone color has been used in the floor and the backsplash. The lovely color is also a great match to the vintage antique white color of the countertops. The kitchen island acts as the center piece and most important part with its granite countertop. The dark wood island features a stainless steel faucet that adds a modern feel to the whole kitchen. The antebellum glass and wrought iron lamps cover the whole kitchen and make for an exceptional design. Although there are stainless steel accessories, the lamps and the cabinets keep this kitchen looking vintage and elegant. This L shaped kitchen features salt and pepper granite countertops with a second island in the center. The red oak floors are the perfect match to make this kitchen so elegant. The brass handles on the kitchen cabinets match beautifully with the brass chandelier that hangs beautifully over the kitchen island. The raised panel cabinets have a lovely antique and vintage feel to them. The marble countertops will match beautifully with the dark wooden island in addition to the chrome finished sink. All of this is put together with the rich walnut wood plank floor. Crown molding is a staple in the world of kitchen designs. Here the design has been used to fill in the spaces between the cabinet and the ceiling. If the space above the kitchen cabinet represents a problem for you then the crown molding design will solve this problem. You can easily include different shades of white instead of true white. Antique white in particular will be of great importance because it is a rich color that will match beautifully with a rich color palette in the background. The look of the kitchen is put together by using the same color in the sink and the dining table. This beautiful chandelier wouldn’t have looked so elegant if you used cold white instead of vintage and warm white in the cabinets. The color matches beautifully with the beige countertops. We love how this kitchen features big glass framed cabinets and a lovely farmhouse sink. The paneled white kitchen matches beautifully with the backsplash and medium tone hardwood. Antique white kitchen cabinets will look beautiful with warm wooden floors and other wooden dark décor. Black and glass lanterns will complement the look together with salt and pepper granite countertops. The leather stools match beautifully as the contrast with black and white adds to the sense of elegance. We love how the stainless steel accessories and the white raised panel cabinets will look great in this amazing kitchen. The vintage rug that runs in front of the sink and the dishwasher is another elegant element.